One athlete sorely missed at the weekend round of competitions was Leevale thrower Joe Nagle, who lost his short battle with cancer last week aged only 43. 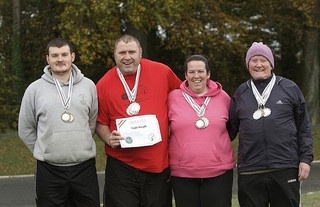 Joe, a gentle giant who loved his sport, collected a number of titles at county and national level, as well as competing at traditional throws competitions in the UK and in Europe with a close-knit group of older Irish throwers. In his earlier years, Joe, like his brother Larry, had been a boxer and forever after, his warm-up included a few shimmies and some shadow boxing. 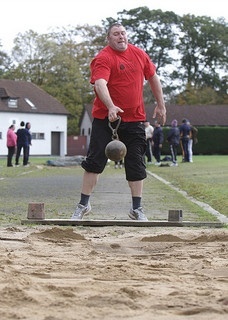 In 2007, he picked up shot putt silver at the 2007 Special Olympics in Shanghai. It was his proudest moment; he had missed the World Games four years earlier when they came to Dublin. 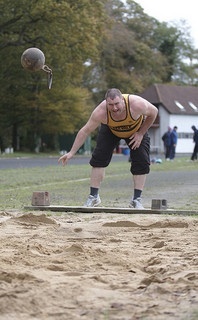 He also competed in the long jump. Joe had a good year in 2009. Now over 35 and eligible for masters competition, he recorded a personal best of 11.45m for the shot and also put up solid marks in the weight for distance and the discus. 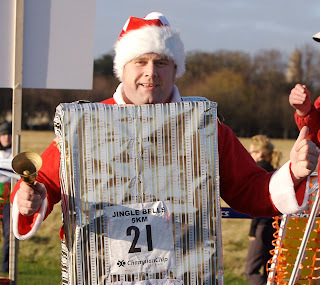 On the roads, Joe was a regular at the annual Jingle Bells 5km in the Phoenix Park, usually in fancy dress and adding greatly to the atmosphere on the day. In June, after his cancer was diagnosed, Joe married Sarah Webb, his partner and sidekick for the past 16 years. The wedding was held in the Sir Patrick Duns ward at St James’s Hospital and it was typical Joe. Although the occasion was tinged with sadness, Joe made sure to look after everyone and to make them feel part of his and Sarah’s special day. That was Joe’s gift; his kind and gentle nature brought the best out in people. He then retreated to his sister’s in Cork where, only a month before his death, he was coaching the youngsters at Leevale in the finer points of shot putting. At no point did he give into his illness or entertain negative thoughts. “I’ll be fighting this. Don’t worry – you’ll see me back competing soon,” he would say. At his funeral in Dublin, Larry remembered his big-hearted brother and asked for a round of applause in celebration of his all too-short life. The response was heartfelt and sincere. Our deepest sympathy goes to Sarah; to Larry and the rest of Joe’s large family, and to the many friends Joe made wherever he went. This is a lovely post. I knew Joe briefly through his participation in the Cabra Lions Special Olympics basketball club. He was a great character and a good person. We’ll miss him. I´m happy that I had the opportunity of sharing some time with Joe, he was a very nice person and full of energy! I knew Joe through his being part of the Cabra Lions and he certainly made his presence felt, and now I feel for Sara, who was his faithful partner in all his exploits. May he rest in peace and keep a benign eye on all his former partners in sports from afar! !